Getting To Know The Goddess Series Film screening & Discussion for Women’s History Month… Signs Out of Time: The Story of Archaeologist Marija Gimbutas. 60 min. 2008 Groundbreaking linguist and archaeologist Marija Gimbutas dedicated her career to studying the female and goddess-centric civilizations of "Old Europe. "Signs Out Of Time examines the life and work of groundbreaking world-renowned archaeologist Dr. Marija Gimbutas. Drawing from her extensive knowledge of mythology and linguistics, Lithuanian-born Gimbutas uncovered the life-affirming and goddess-worshipping civilizations of pre-historic "Old Europe." Her work in mythology has long been considered a worthy companion piece to the famed theories of colleague Joseph Campbell; Gimbutas's theories on prehistoric gender roles continues to influence contemporary scholars as well as the modern-day "women's spirituality" movement. Our Goddess Series is hosted by Linda Webster. Linda has been a member of the First Unitarian Universalist Women’s Spirituality Group since 1985, facilitating women’s circles, rites of passage, and rituals for pagan holidays. Linda is also a Veriditas-certified labyrinth facilitator. 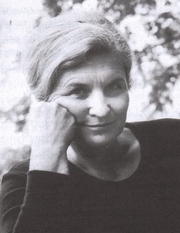 Marija Gimbutas is currently considered a "single author." If one or more works are by a distinct, homonymous authors, go ahead and split the author. Marija Gimbutas is composed of 8 names. You can examine and separate out names.